Editor’s Note: Nancy Orloff passed away Dec. 26, 2010. This is the story of the fulfillment of her dream. Nancy Orloff, 93, may have spent her early years in Chicago, but her heart is in Front Royal, Virginia, the place she called home for more than 50 years. Nancy moved to Front Royal—a small suburb 60 miles southeast of Washington, D.C.—as a young bride shortly after World War II. The newlyweds soon put down roots in their new community, and raised their only daughter, Barbara, there. Nancy ran several businesses in Front Royal, including one that served as a gas station, country store and diner. “Nancy did it all,” recalls Barbara. “She’d do oil changes and run the grill. But, she could clean up and look like a million dollars.” Nancy was also very involved with her church and in the community, as a businesswoman and member of the local chamber of commerce. But, Nancy left her beloved Front Royal behind seven years ago, when she moved to California to live with Barbara. At that time, “she was still getting around, with a cane and then a walker,” Barbara says. 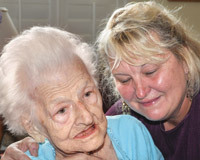 Her health declined over the past two years, and she is now under the care of NorthBay Hospice & Bereavement. That’s when the Dream of a Lifetime team learned that Nancy wished for one more visit home. It turned out to be a complicated dream to fulfill, as the Dream Team was faced with the frustrating logistics of traveling 3,000 miles with a patient in declining health. Dream of a Lifetime then hired a Front Royal photog-rapher to accompany Barbara and document the trip, and also provided Barbara with a camera and Flip video so she could record interviews and take pictures. The timing was fortuitous, as one of Nancy’s good friends passed away just days after being interviewed. Gino Goodman, Nancy Orloff, Frances Demerin and Nina Gaston and their families were recipients of the NorthBay Hospice & Bereavement’s Dream of a Lifetime program that grants wishes of the terminally ill. Begun in 2009, this is one of the few programs nationwide that fulfill the final dreams of adults. I was so fortunate to have my mother Nancy on NorthBay Hospice for two years. The Dream of a Lifetime was truly special for both me and my mother. It was rewarding to go back to Virginia to visit mother’s neighbors, church friends and community where she spent so much of her life. The DVD was watched by Nancy several times before she passed in December. How wonderful for me to have this wonderful gift to view for the rest of my life. I have known Barbara and her loving mother since high school and I am eternally grateful for the care and help that hospice has given to her. The loving relationship that Barb had for her Mom was a gift indeed, not seen too much in this world now. May this loving example be a light for the world to pass on.